We’d love your help. Let us know what’s wrong with this preview of Unfathered by Disa Mogashana. Unfathered is a memoir of rejection and abandonment, but also a story of the search for healing. Written as a long overdue letter to her father, Mogashana is at pains to let him know of her life, and of growing up torn by a bond that always seemed to come loose at the seams. A quest by a daughter to finally have the conversation that matters, but also to let her father kno Unfathered is a memoir of rejection and abandonment, but also a story of the search for healing. Written as a long overdue letter to her father, Mogashana is at pains to let him know of her life, and of growing up torn by a bond that always seemed to come loose at the seams. A quest by a daughter to finally have the conversation that matters, but also to let her father know of the consequences that came with his absence in her life. To ask other readers questions about Unfathered, please sign up. Hi Disa!!!! Wow!!!! What a powerful read. Could not put it down till I finished. Very inspiring too 'cos I believe that one should deal with all one's stuff positively - that way enriching one's lives (as opposed to drinking or drugging ourselves to numb whatever pain). For me, this book is a reminder that we are the only ones that live in our bodies and we need to take care of it....no one else can (internally, that is!). Very well written, Disa! Had a good laugh with the castor oil and burglar Hi Disa!!!! Wow!!!! What a powerful read. Could not put it down till I finished. Very inspiring too 'cos I believe that one should deal with all one's stuff positively - that way enriching one's lives (as opposed to drinking or drugging ourselves to numb whatever pain). For me, this book is a reminder that we are the only ones that live in our bodies and we need to take care of it....no one else can (internally, that is!). Very well written, Disa! Had a good laugh with the castor oil and burglar repair incidents. Reminds me of something I'd do (naughty me! hahaha). I have finished reading the book,You are a good writer and storyteller.I found it a bit hectic,I felt a big lump on my throat as I was paging through and I felt every emotion with you.It also got me thinking about my life,and how I would never dare to speak about my experiences the way you do with yours.I admire your courage and honesty.If I were to summarise the book in one word ,it would be:"RAW" .Thank you for sharing your life with us and I look forward to reading more books from y Dear Disa. It has never happened to me. Having read countless memoirs, there is no doubt in my mind that there was ever been a book that dug deep into my soul forcing me to close it because my welled eyes would not continue to read. Disa Mogashana has tapped into her inner struggles as she grew up in Thaba Nchu without a father. Mogashana’s debut Self-published novel, ‘Unfathered’, is a brutally honest narrative that pierces the heart and soul of the reader as the writer bares her cyclical relationship wit It has never happened to me. Having read countless memoirs, there is no doubt in my mind that there was ever been a book that dug deep into my soul forcing me to close it because my welled eyes would not continue to read. Disa Mogashana has tapped into her inner struggles as she grew up in Thaba Nchu without a father. 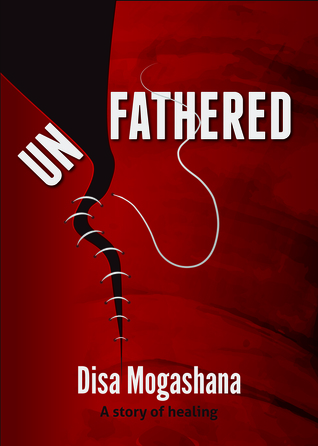 Mogashana’s debut Self-published novel, ‘Unfathered’, is a brutally honest narrative that pierces the heart and soul of the reader as the writer bares her cyclical relationship with her absent father. Mogashana’s tumultuous life starts at a very early stage of her life. A ‘product’ of teenage pregnancy, her parents soon find themselves embroiled in a quagmire of tribal disputes between her paternal and maternal families. The book is not one of those shallow and poorly written ‘how to’ better your life on book found on book store shelves. Beautifully written, the author seeks to inspire those that find themselves in a situation similar to hers, but through sheer determination rise up to the challenges of being ‘unfathered’ and conquer the world. I want to ask you, plead, urge, bribe and persuade you to join Moshana on this expedition of Unfathred and treasure this book as a guide to address the challenges in relationships of your children, grandchildren and great-grandchildren. The marketing for this book leading up to the launch was the first exciting bit for me and i just had to have this book. The launch was probably another two months away at that time and I looked forward to having the copy in my hands daily until the launch so i could get ticked in to the story. The launch in Cape Town was educational, emotional, eye-opening and created good conversation that night around the topic of absent fathers. Great panel too! The book itself was about a topic I could person The marketing for this book leading up to the launch was the first exciting bit for me and i just had to have this book. The launch was probably another two months away at that time and I looked forward to having the copy in my hands daily until the launch so i could get ticked in to the story. Disa Mogashana is a wonderful story writer; quite descriptive in her recollections of her past, entertaining and certainly grabs your attention early on in the book. I learned quite a bit about the Sotho culture and was able to link it to mine (coloured people also make the oldest child the mini slave in the house). There were some phrases that were written in Sotho and probably can't be said in a better way other than in Sotho but maybe a rough explanation somewhere would have been useful. This book is for all types from all walks of life because it's a topic that knows no skin colour and it is the essence in my opinion of lots of fails in life (poor education, disruptive adulthood, insecure people in life, high crime etc). The message I strongly support and haven't stopped talking about is the importance of both parents and their availability both emotionally and financially. . .
To the dads who constantly work, your child's memories unfortunately won't be many of you. To the dads who silently observe without a peep, your child does wonder why you haven't reached out even if the child is now a parent, it's never to late. To the dads that are able to have fun with, cry with, be there for the child, even if you can't always support the latest gadget for your child, you are a real dad and I salute you! To the dads who step in for absent dads and take on that responsibility because they want to, I salute you even more! In south Africa our statistics are super scary (high crime, unemployment, uneducated citizens, overfilled prisons) and clearly we need to rebuild our nation from the bottom up. It starts here...with responsibility! I would have loved to read a sequel to read about her dad's reaction to the book. In an amazing letter penned with brilliance Dr Disa opens many other letters that have been trapped in many hearts for years. Unfathered explores the battles that a child who grows up without their father gets to fight daily. In an account of an impact that her father’s absence has had on her, she manages to be the voice of many people who want their father to know what their absence meant. Written from personal experience, Dr Disa’s life story is one of struggle, one of perseverance and one of In an amazing letter penned with brilliance Dr Disa opens many other letters that have been trapped in many hearts for years. Unfathered explores the battles that a child who grows up without their father gets to fight daily. In an account of an impact that her father’s absence has had on her, she manages to be the voice of many people who want their father to know what their absence meant. Written from personal experience, Dr Disa’s life story is one of struggle, one of perseverance and one of victory. Unfathered is not just a memoir, it is the reality of our present world. It shows how parents’ absence in the child’s life will forever impact on their self-esteem, self-worth and self-love. It is the story of rejection endured since childhood. It’s painful and confrontational but written for HEALING. The reader won’t help but shed a tear as they see themselves in this masterpiece. Once started reading it, it’s not easy to put it down. Unfathered is the story of hope, it is the story of healing and it is the letter addressed to every absent parent. The hope is that they will pick it and read it…for their healing too. I highly recommend it to everyone who is looking for true healing. I recommend it to every absent parent, for in it their impact is openly revealed. Thank you Dr Disa for healing the nation. May this letter reach every parent in this world and help them take their position! This is a very honest book. It shows just how deep the impact of the father, or rather lack of, can be to a child. Because of behaviours that have now become norms, we tend to understimate the importance of a father's involvement in raising their children. A lot of people who have experienced this form of an injustice will relate better to the book, while those who have no idea might be tempted to label some of the feelings manifested as an unhealthy sense of entitlement. But, that is just it! T This is a very honest book. It shows just how deep the impact of the father, or rather lack of, can be to a child. Because of behaviours that have now become norms, we tend to understimate the importance of a father's involvement in raising their children. A lot of people who have experienced this form of an injustice will relate better to the book, while those who have no idea might be tempted to label some of the feelings manifested as an unhealthy sense of entitlement. But, that is just it! That is the point! Don't be surprised when you end up dealing with a 3 year old in a 33 year-old's body because of the gaps created in childhood! A lot of this author's story was quite heartbreaking, though there was the occasional humorous moment. By the end of the book, things had somewhat stabilized, though the author did have to make peace with certain things. I feel that example reasons for fathers who are unavailable could have been given, since most likely due to privacy reasons, the deeper reasons for her own father's unavailability wasn't mentioned. This review has been hidden because it contains spoilers. To view it, click here. This is a good read. Dr Disa Mogashana is the Managing Director at True Success Institute (Pty) Ltd, a company she established to help others find inner strength to triumph over their circumstances and achieve their true success. She is a Life Transformation Coach and NLP Practitioner, and an Inner Freedom Coaching Practitioner. Her areas of interest include Relationship Coaching, Personal Success Coaching, as well as Dr Disa Mogashana is the Managing Director at True Success Institute (Pty) Ltd, a company she established to help others find inner strength to triumph over their circumstances and achieve their true success. She is a Life Transformation Coach and NLP Practitioner, and an Inner Freedom Coaching Practitioner. Her areas of interest include Relationship Coaching, Personal Success Coaching, as well as coaching, mentoring and advising students. She has a strong academic background, having completed a BSc degree in Chemical Engineering, a Masters and a PhD in Engineering Education. She has lectured at the University of Cape Town. Disa has tapped into her inner strength to overcome many negative influences in her life. With positive energy, she brings light to those who are yet to deal with their inner struggles. In this book Disa presents her narrative about growing up without a father. She challenges those who are like her, and others, to rise above their circumstances and draw on their inner Personal Power. She challenges parents to be aware of the consequences of emotional and physical absence in their children’s lives.